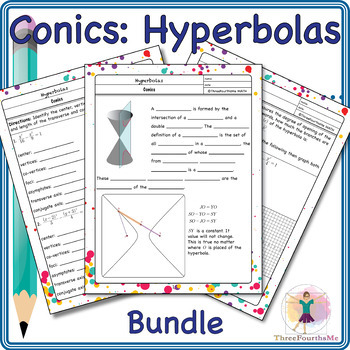 Contains scaffolded notes, classwork, and homework for:parabolas,ellipses, and hyperbolas. Detailed step-by-step teacher keys are provided upon purchase. The preview contains all student pages for your perusal. I hope you are able to use this product for the betterment of your students and it makes your life easier. If there is a topic you would like me to develop a product for or if you would like me to alter an existing product to better match your teaching style, please let me know at: threefourthsme@gmail.com.